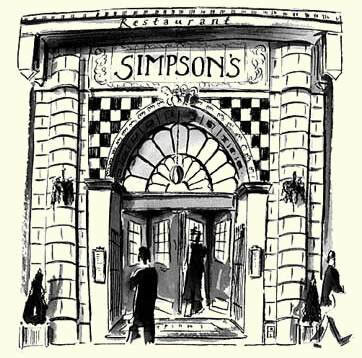 Film Noir Buff: London Life: WestEnd Style (Part Two). What follows is short trip through the working day of a WestEnder, the places he may go and the people he might meet. For diversity I’ll take him to the fringes of his home territory and introduce some of the other London tribes he may very well come into contact with during the course of a day in the city. Let’s start the day with lunch! Today our WestEnder is required to go to the very limits of the WestEnd world for lunch – Beyond even Covent Garden to the home of his company’s solicitors in Chancery Lane, that buffer zone between the WestEnd and the City of London where all the legal boys hang out. Well, where else do men go to eat good red meat near Chancery Lane? But our WestEnder isn’t dealing with Denton Wilde Sapte so we’re heading off to The Gaucho instead. Our WestEnder will be in his working clothes: The soft grey suit, the burnished brown leather shoes, all the stuff from part one of this odyssey. Our Chancery Lane boy, however, will look just a little bit different. And in a ‘harder’ fabric than a WestEnder would chose too: a tightly woven worsted. The kind that can go a bit shiny if the dry cleaners mess up whilst pressing it. Grey or navy blue 3 button with side vents in the usual ordinary English cut. Chalk stripes would be more Denton Wide Sapte (And that’s the last time I’ll mention them I promise). Maybe he got his suit at “Stanley Ley“http://www.stanley-ley.co.uk/ down at the bottom of the Lane. … And a white shirt! Plain point tennis collar, sober small repeating pattern tie (Dark blue, dark burgundy or dark green background, never red), gold cuff links, but new so they still shine a little bit too much. But don’t knock him – he’s a hard worker looking to get ahead so he’s playing it safe. And you can tell he’s ambitious by the way he’s brushed his hair back to give himself that wonderful legal profile that you see in all those great Daumier prints. He’s a chancer on the way up, so good luck to him. By this time next year he’ll be with another firm yet again and probably in Ede and Ravenscroft Chalk stripes if all goes according to plan. Life is one long game of Snakes and Ladders down on Chancery Lane. … And all too soon it’s 3pm and time for our WestEnder to head back to the office. You can run, you can hide, but if you work in the WestEnd in an office with at least a handful of women then sooner or later you’ll end up at Strawberry Moons. It’s like a little bit of Essex in the WestEnd (To put that into context I once heard New Jersey referred to as the Essex of America. Does that make sense?). Be a man and deal with it. The Men in Black have blonds in black underwear on the brain too, but they’re probably a little more serious about the quest than our WestEnder. He’s maybe after a little fun, they’re often here to find Miss Right although they’d never admit it. The Men in Black are pretty much just standard issue British businessmen. They’re the same in Manchester, Reading, Newcastle, or Nottingham. They keep the country ticking over. Department store three button black suits! Often from Debenhams. They take RTW literally and actually wear Ready To Wear clothing without having it altered it to fit them, bless them. I love it when the cuffs of their jackets slide down their hands as they reach for their drinks and then they shake them back over their wrists as they raise the glass to their lips with a quick sideways look to check that you haven’t noticed. To be honest they’re all really nice guys, it’s just that they’re also just a tiny little bit… clueless? 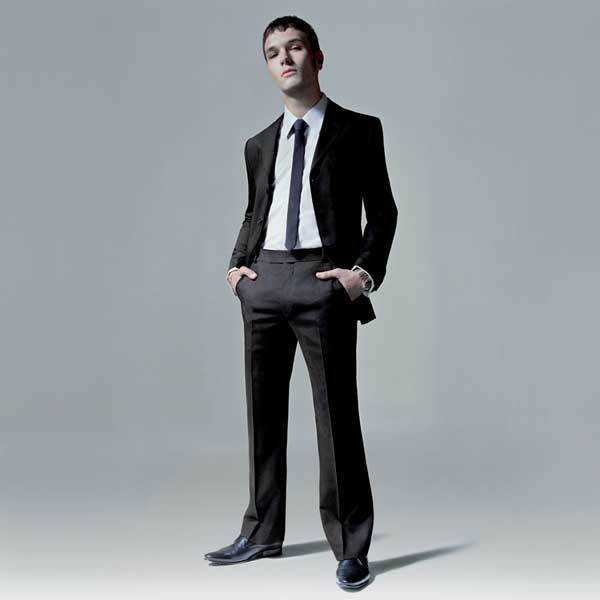 The Men in Black do read the men’s fashion mags though and so their shirts, ties and cufflinks are always whatever is currently a la mode, albeit within their slightly limited budgets. 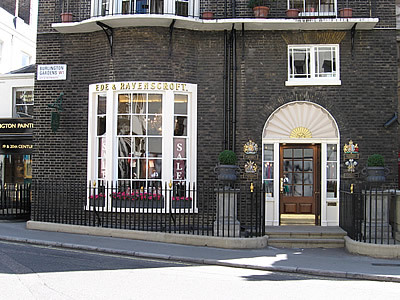 Charles Tyrwhitt is big with them. But Pink is their ultimate goal. 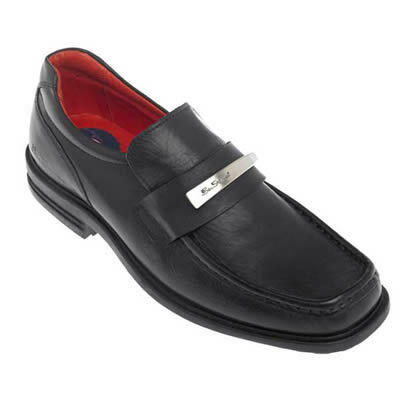 And they are also the kings of the big, black, square-toed, slightly orthopedic looking shoe. They’re actually really rather smart dressers. Well, not smart in that sense, but they’re clever dressers. The suit stays the same pretty much but they bring in all sorts of different colours, textures and accent details in their choice of shirt and tie. The fit of their clothing may not be quite up to snuff, but they do take a certain pride in how they look and what they wear. And, as I say, they keep the country ticking over. Their country needs them. But enough of them – Time for our WestEnder to eat again and to meet some more different people – Variety is the spice of life! Why else do we choose to live in cities? 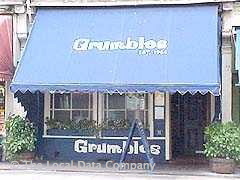 Grumbles is softly lit and wood panelled like a cigar box with jokey pictures on the walls to laugh at if the conversation with your date hits a sticky patch – A wise choice. And being Pimlico it is in another of London’s “buffer zones”, for in Pimlico you can easily rub shoulders (and knees if your tables are too close together) with various “B list” Members of Parliament who have flats nearby. “A list” MPs tend to have flats in Westminster itself just up the road, but I think I like the “B list” boys more – Junior Members of Parliament and those from the Deep Provinces (a little like the “Deep South” in America, but usually from the Midlands in England). They haven’t yet picked up the professional arrogance of the “A list” crowd. They’re still eager to please. Clothes that tell you all about their individual political party’s aspirations and marketing positions! And with their jeans will be their old trainers worn with their dark (navy, charcoal or black) work socks. Up top they’ll wear some God-awful shirt from God-knows-where. Might also be denim even. And it could do with ironing too. Poor chaps, they’re far from their wives and families back home in their constituencies and so their clothes can often get in a bit of a muddle. What they need is a woman’s touch. But when you’re an ambitious MP how can you get one in the big city without there being a national scandal? And so they soldier on alone. Conservative: Old “I-own-half-of-Shropshire” cords with bits of food stuck to them. Un-ironed tattersall shirts or old stripey business shirts with collars so worn that you can actually see inside them and note their construction. Lambswool V-necks with holes in the cuff where they’ve rubbed on their wristwatches everyday for the past 15 years. Old shoes once worn for work probably, but now just being worn out. They want you to think they don’t give a damn how they look, they’re far too focused on running the country for such trivia. In reality nobody actually looks like they do by accident. It’s all carefully put together to look careless. I suspect that those of them without dogs even go so far as to buy Labrador or Golden Retriever hair on some kind of black market from pet shops to rub on to their trousers just to get the look down to a “T”. They look great, whatever their politics may be. Younger ones may wear Rugby shirts and canvas jeans that fit. It’s getting late now so we’ll draw a veil over our WestEnders for a few hours. Our WestEnder’s girlfriend has a top floor flat in nearby St.George’s Square up 4 flights of stairs (with each flight narrower and more dimly lit than the last) and so from Grumbles our couple will move on to her place for a spell I think. These things happen. Who are we to judge? 3am is traditionally when the whole of London gets the munchies. Some raid the fridge. Some try to go to sleep and ignore them. Some do what all the best people do and head East – It’s bagel time again! 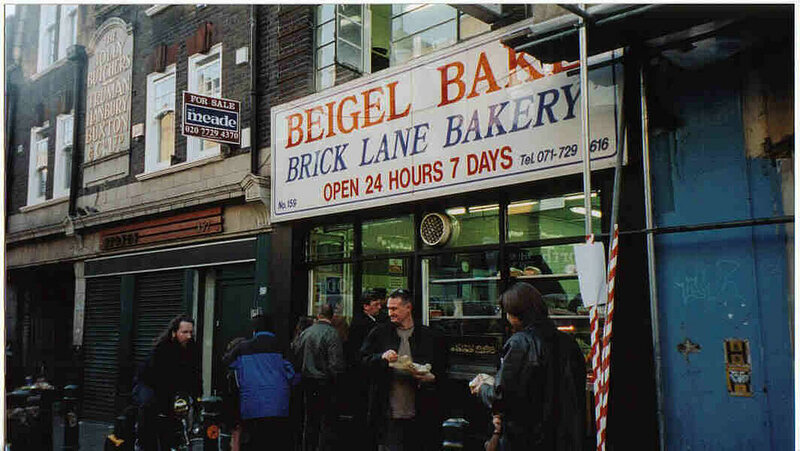 The Brick Lane Beigel Bake is the place where the whole of London meets and ends up having to queue no matter what hour of the day or day of the week it is for bagels. And it is here in that queue that East meets West and North meets South and you realise that the world is full of different people and that they all live in London. A certain kind of WestEnder may have a certain kind of style, but when you pick him up and drop him down into the East End he becomes just another face in the crowd because out East everybody is different. 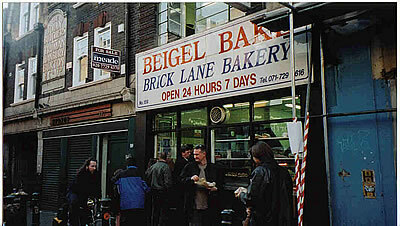 A typical EastEnder is always an atypical EastEnder and the queue at the Beigel Bake proves it. All races, colours, religions and persuasions mix together there as a wonderful reminder that people are just people and trying to pigeonhole them and classify them in any meaningful way is just a waste of time and I think I like that. And so that seems to me like a good note on which to end this attempt to pigeonhole and classify the various styles of people living and working in and around the WestEnd of London. “WestEnders”, “Chancery Lane Chancers”, “Men in Black”, “Honourable Members” and “EastEnders” are all both real and unreal at the same time. They may share certain very superficial characteristics, but that’s probably all that they really do share in the final analysis. It’s only what’s on the inside that counts anyway.